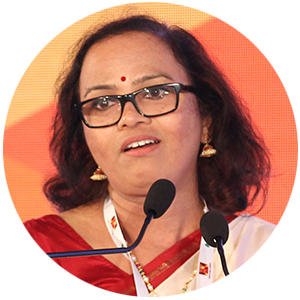 Vidya Tikoo has been responsible for overall development and management of the Aditya Birla Group Sustainable Business Framework since December 2013. Aditya Birla Group a multinational business conglomerate having a presence in 42 countries, 120,000 employees and a turnover of 44.3 billion USD. She was appointed as the Vice President Sustainability to head the Group Framework development and in that role she is committed to realizing developing and releasing a set of policies, standards and guidance notes applicable for all the 17 businesses of the Group to. In 2016, she successfully completed the framework, got it assured and now certified to meet the requirements of 14 international standards. She has now moved to implementing a few of these standards into various businesses of the Group. To mention a few: transportation, supply chain, human rights, project development, acquisition and divestment, and sustainability reporting. As a Senior Vice President with the Group, keeping the framework updated, adding on new standards to it, ensuring certification of the framework to more international standards and leading the communication from the Cell to all the businesses globally to raise the awareness of the framework and communicate the performance of businesses is her prime responsibility. She is actively promoting the human rights aspect within the businesses to help them develop systems for conducting human rights due diligence and creating action plans. Vidya has a diverse experience as functional leader in consulting and corporate jobs in management systems; requirements of international standards for environment, health, safety, human rights, supplier management; integrating sustainability within business decisions for supply chain, acquisition, projects; EHS legal compliance; waste management; ESIA; etc. Vidya graduated with a degree in Environmental Pollution and completed her Masters in the same subject. After working for a consultancy firm for 6 years she went on to do research in Environmental Biotechnology and secured a Ph.D. from the University of the West of England, Bristol, UK.